IT was the Ardra darshan celebrated as the day when Siva showed his ananda [? ]-tandava (dance of bliss) to Patanjali and others at Chidambaram in fulfillment of a promise made to Adisesha at Daruka forest. In the village of Tiruchuzhi, Bhoominatheswara along with his consort Sahayamba, was about to enter his abode after going round the streets of the village blessing his devotees. That was December 29, 1879 well past midnight, hence it was December 30. The moon was in the constellation of Punarvasu. Bhoominatha halted a little while at the entrance of the temple and there in the house a male child was born. Sundaram Iyer's mother was disappointed and gave expression to it. The lady of poor sight asked the reason for her disappointment to which she replied, "You know very well that my daughter Lakshmi is no more, her son Ramaswami is growing up here. The first child was a girl who has gone. The second is Nagaswami. Now again it is a boy. If the child had been a girl we could have married her off to my daughter's son. Where is the chance now? How will the family tie continue? This is all I am destined for!" The old lady admonished her and consoled her, "Enough of this, be quiet. The boy is a darling. He is enveloped in great light. Don't you see, he is an avatar? How can you weep over this?" How did that lady of poor sight know? According to the solar calendar it was the 16th day of Margazhi of Pramadi year. According to the Lunar calendar it was Pramadi, Margaseersha, Krishna paksha (dark fortnight) 2nd day, night 19 1/2 ghadis, Tula lagna. 1 This house has since been taken over by the management of Sri Ramanasramam and is known as Sundara Mandiram. Daily worship is offered to Sri Ramana's picture here. THE family Deity was Sri Venkateswara. Sundaram Iyer's elder brother was named after him as Venkateswara Iyer — a fine person who used to offer half of his earnings to the goddess Sahayamba. He became disinterested in worldly affairs even by the time he was eighteen. Saying that he would pay a visit to Tirupparankundram near Madurai he left home for good. He lived as a renunciate at Chidambaram and spent his time cleaning up the pathways surrounding the temple, for the benefit of devotees. The new born was named Venkateswara after the paternal uncle and the family Deity. One of Sundaram Iyer's paternal uncles was also a renunciate by name Sivananda Yogi, which was why when his father, Nagaswami Iyer passed away before the children came of age, the burden of the family fell on Sundaram Iyer. As a boy of sixteen he took up a job as a clerk on a monthly wage of two rupees. Intelligent, hardworking and popular he quickly learnt how to draft legal documents. He was tactful in his dealings with the officials as well as common people. Even without appearing for any tests he obtained a licence to be a pleader, a facility then available. He quickly established himself and became prosperous. He built a large house which had two portions — one to serve his domestic needs and the other to be a guest house. Officials who were posted to Tiruchuzhi stayed there until they secured their own accommodation. Sundaram Iyer knew what hardship was and so his was an open house for the needy. Alagamma never turned away anyone who needed food. She was Goddess Annapoorna herself! The couple became well known for their goodness, generosity and appropriate conduct. 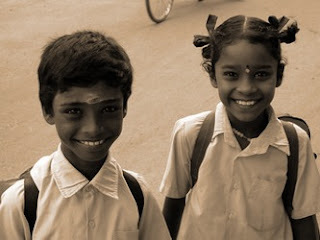 In fact both the words Sundaram and Alagu mean the same — beauty! In the house, regular worship of Siva, Vishnu, Ganesa, Surya and Sakti was carried out. As one of the village elders Sundaram Iyer helped in organizing purana- kalakshepas at the temple and was generally helpful in temple affairs also. He never went about exhibiting his devotion openly, possibly he had a preference for the jnana- marga. He was of a serious temperament and was not quite free with or very close to his wife, brothers or children. Alagamma, on the other hand was quite open about her devotion — she went about reciting the Dakshinamurti stotra and similar Vedantic hymns. She made it a point to learn as many devotional songs as possible and used to go to anybody's house in the village to learn a new song. She got initiated into the sakti-panchakshari japa. She was quite orthodox and performed Surya namaskaras regularly. Sundaram Iyer's family belonged to the Dravida, Smarta, Brahacharana lineage. They followed the Yajus sakha, Apasthamba sutras. They belonged to the Parasara gotra with Vasista sakti Parasara rishis. Their family name was Tiruchuzhi. THE child Venkateswara was unique. He seldom spoke or quarrelled. There was a close relative, Meenakshi of his age. He would not suckle his mother's breast if Meenakshi did not also suckle milk; he was so indifferent about his feeding. He had a sweet and gentle smile but behind it was a determined nature. While admitting him in school in due course, his name was noted as Venkataraman. This name stuck. Lakshmana Iyer a close relative of the family was well- versed in Telugu. He used to address the child as Ramana or on occasion as "Nayana Ramani". "Nayana" in Telugu literally means father but is also used as an expression of endearment. The child adopted the Telugu tradition and addressed his father as Nayana, unlike the rest. In course of time the other members also adopted this mode of addressing. This extended to outsiders as well, all of whom began addressing Sundaram Iyer as "Nayana." Venkataraman always had his way. One day, Sundaram Iyer set out from his house on business. He placed two pillows in a cart. The child remarked, "Nayana, the first pillow will drop off." The father ignored this and went away. In a little while, the child's prophecy came true. Sundaram Iyer was astonished — how could the boy know beforehand? In his eighth year Venkataraman had his upanayana. He learnt to say in the ancient traditional way, "I, Venkateswara Sarma pay obeisance." The school in which Venkataraman was admitted was run in a mantapa. The head master was one Madhura Nayagam Pillai. Only Tamil was taught there up to the fifth standard.1 Sundaram Iyer wanted his sons to be educated in English so that they could get into government service. But at Tiruchuzhi nobody taught English. Sundaram Iyer had two younger brothers — the elder one among them, Subbu Iyer, was a clerk in the Sub- Registrar's office at Dindigul. 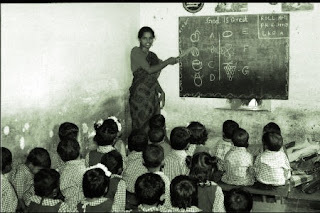 There was a Hindu School at Dindigul where English was taught. Nagaswami was put in that school. Venkataraman also was sent there in 1891 to join the sixth standard. The brothers were like Rama and Lakshmana (who had the support of the monkeys). These brothers had the support of a group of young boys! They were friendly and healthy. The elder one was an adept at jumping on the tree branches, and was nicknamed "monkey." The younger one was always a winner and came to be known as one with a golden touch or with a golden hand (thanga-kai) reminding us of one of the several names of Siva, "Hiranyabahu" (Golden armed). The brothers were interested in gymnastics, wrestling and football. The younger one simply followed his brother — he had no particular preferences. If provoked to a fight, he was unsparing which was why even those older than him left him alone. Venkataraman was never afraid of being beaten up either. Venkataraman was a sound sleeper. At Dindigul, their house was in Abhirami Amman Kovil street. On a birthday of Srinivas, son of Subbu Iyer, after the evening meal was got ready, the rest of the family went to the temple leaving Venkataraman to look after the house. A little later, he bolted the door and fell asleep. The family returned late in the night and knocked at the door but there was no response. They pounded on the door and made a lot of noise which brought forth several neighbours on the scene but all of this was of no avail. Everyone was wondering as to what had happened to Venkataraman. After several attempts they succeeded in opening the door. Thereafter they gathered round Venkataraman and tried various means to wake him up. They wondered at his sound sleep and likened him to the legendary Kumbhakarna. Getting to know about this quality of his, some schoolmates who were earlier beaten up by Venkataraman but were afraid to retaliate, would take him while asleep to a lonely spot, thrash him and bring him back to his bed. By their words and hints on the following day, Venkataraman would guess what had transpired the previous night. As mistaken by some, that movement of Venkataraman during sleep was not due to somnambulism. Sakti (power) is of two types — one is mental, the other practical. During deep sleep these lie dormant in the body and do not get dissipated as in the waking state. That is the reason why the body becomes energetic as soon as it awakens. Owing to the sadhaka's will sakti does not get wasted externally through the sense organs; it becomes turned inward towards the Self. Deep sleep is involuntary, hence it is a state of ignorance. On the other hand, Samadhi is voluntary and is a state of knowledge. For Ramana, the body was able, through this deep sleep state to sustain a state of tapas [?] in later years. Neither of the brothers was particularly interested in studies. Maybe, the elder one was a little better. The younger one, on the other hand, remembered that there was such a thing as education only upon seeing the teacher's face! However, he had the faculty of committing to memory anything he heard once. But he took particular care to memorise Tamil poems. He never aspired to become a scholar nor did anyone expect him to become one. Subbu Iyer was transferred to Madurai in 1891. The brothers also moved with him. They were admitted in the Scott Middle School in the North Avani Street. Their residence was in North Chitrai Street. 1The nomenclature of classes was different during those days. SKIRTING Tiruchuzhi on the North Eastern and South Eastern sides is the Kaundinya river famed as the Redeemer of Sins. During a famine, the rishi [?] Kaundinya performed tapas [?] of Siva and this river was born. The king of Malva, Somasila, was a leper. He heard of this river as a Redeemer of Sins and bathed there. True to its name, the river cured him of leprosy. Such is the legend. The Tiruchuzhi tank had a peculiar feature. The water level of the tank was higher than the ground level of the town; yet the water never overflowed. Opposite the temple, there was a water bed known as Soola tirtham. The legend goes that during the deluge Lord Siva lifted that piece of land with his trident to save it from getting submerged. The water bed arose out of that — all the water sank into that space. Because of this water-bed the place got its name Tiru (sacred) chuzhi (swirl). The Soola-tirtham is to the east of the mantapa in the temple tank. During the month of Magha the water level of the tank would rise step by step and on the tenth day the tank would be full. Siva in the mantapa was thus given his abhisheka. Thereafter, the water level would go down during the next ten days. This was an unfailing phenomenon irrespective of the intensity of the rainfall. The water level here had nothing to do with the level of water in the town's wells. A bath in the waters of Soola tirtham would cure several skin ailments. Sundaram Iyer bought a piece of land on the North Eastern end of the town and donated it to the public, to serve as a cremation ground. In 1892 Sundaram Iyer fell ill. Subbu Iyer, along with his nephews visited him. But within four days he passed away. By then he was forty seven. Sundaram Iyer was cremated at the very ground donated by him. Sundaram Iyer was popular and well-respected — even by way-laying robbers. He left behind four children - Nagaswami the eldest was fourteen, Venkataraman was twelve, Nagasundaram six and Alamelu was an infant. 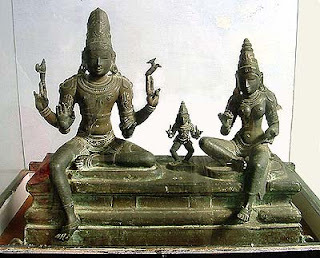 After the ceremonies Subbu Iyer returned to Madurai along with Nagaswami and Venkataraman whereas Alagamma stayed back with her two younger children. Their responsibility was taken over by Nelliappa Iyer, younger brother of Subbu Iyer. After this calamity, Nagaswami began bestowing greater attention on his studies; but there was no change in Venkataraman at all. In addition to his old sports he learnt to swim either in the river Vaigai or in the Pillayar Tank. Also he learnt to throw and catch a small vessel full of water as if it were a ball without spilling even a drop of water. To indulge in their midnight games at the Vaigai the boys used to cover the bed with pillows which in turn were covered up by mattresses to give the impression that someone was asleep. They would jump over the wall and melt in the darkness outside. There was a garden close by and near its compound wall each member of the team used to leave a small stone to indicate that he was on his way to the Vaigai. The boys played till about two or three in the early hours and returned home. Apart from this, swimming in the swirling waters of the Vaigai during floods was another favourite sport of the boys. From his very childhood, Venkataraman's words had an authority of their own. Abdul Wahab, a Muslim, was the captain of the football team of the boys. Once Venkataraman went to Wahab's house and on learning that they ate non-vegetarian food, expressed his revulsion. With that pronouncement, Wahab gave up non-vegetarian food forever! Wahab later served in the Police Department and retired as a Superintendent of Police. For his ninth standard, Venkataraman joined the American Mission High School. The college run by the same Mission was in its neighbourhood. Life was as usual, listless and aimless. He would visit Tiruchuzhi during vacations. 1This house has now been taken over by Sri Ramanasramam and is named "Ramana Mandiram". Daily pooja is performed here. It was November 1895, Venkataraman was a student of ninth standard. He was on his way to the school at about ten in the morning, when he ran into Ramaswami Iyer, son of Lakshmana Iyer's brother — a resident of Tiruchuzhi. He was their relative, elderly too. Venkataraman, with natural affection, asked him, "Where are you coming from?" The reply was "From Arunachala." The word "Arunachala" was familiar to Venkataraman from his younger days, but he did not know where it was, what it looked like or what it meant. Yet that day that word meant to him something great, an inaccessible, authoritative, absolutely blissful entity. Could one visit such a place? His heart was full of joy. Arunachala meant some sacred land, every particle of which gave moksha [?]. It was omnipotent and peaceful. Could one behold it? "What? Arunachala? Where is it?" asked the lad. The relative was astonished, "Don't you know even this?" and continued, "Haven't you heard of Tiruvannamalai? That is Arunachala." It was as if a balloon was pricked, the boy's heart sank. Venkataraman had heard the name any number of times. Yet he was never moved. Why did it happen then? No spiritual stirring had ever showed itself in Venkataraman's life till then. There were occasions when he had trifled with pooja articles too. He was so irreverent. He worshipped Siva routinely, visited temples on holy days as a formality but not because of any inner urge. Once, on a night of festivities the boys went to Tirupparankundram. They were hungry but food was yet to be served. They hung around the kitchen. Just then the temple official went out on an errand. The boys opened the lock of the door, went in and took as much food as they wanted and went away to the river bank, had their fill, left behind the rest, washed themselves and went back to partake of the food being served! That was the boy's prasadam. Normally, nobody touches the food before it is offered to the deity because it is considered improper to do so. Long after this event Bhagavan said, "The food was indeed offered." How true it is! It was offered to the one for whom it was intended! The Bible was taught at the school. Venkataraman was not interested even in the secular education imparted there — what to speak of the Bible? Yet how did the emotional upsurge arise? What was the relation between Arunachala and Venkataraman? ONE or two months later Venkataraman chanced upon Periapuranam borrowed by Subbu Iyer from some one. The epic was authored in the following circumstances. The ruler of the Chola territory, Anapaya Chola was a Jain and a tormentor of Saivites. One of those thus tormented was the poet Sekkizhar. "Did not Tirunavukkarasar (Appar) give away in charity all his patrimony and take to Jainism? Did he not reconvert to Saivism due to the ministrations of his sister? Why did not some such thing happen to the king? This is Siva's territory and there are twelve kshetras, six kumarasthanas, five lingas each of an element and 1008 Sivasthanas. The great Nayanmars devoted their entire lives to the praise of Siva, they revelled in the very thought of the magnificent form of Siva, they looked upon themselves as just specks of dust at the feet of Siva and extolling Siva, sang songs which gave great joy to the common populace. Won't this king get converted on hearing the stories of these devotees? I shall enshrine them in a book," thought Sekkizhar and took up the work. But alas, no word came out of him. He wept bitterly and prayed to Siva in utter helplessness. Siva himself spelt out the first word  thereafter Sekkizhar's devotion poured out, as Siva's grace, and resulted in Periapuranam. The poet recited this to the Chola king in the presence of Nataraja and was blessed. The first religious text that Venkataraman read was Periapuranam. It was as if he entered a new world altogether. The more he read the greater was his thirst. The Lord of Time was the monarch therein hence there was no fear of time. The subjects were all contented devotees of Siva. Devotion, love, peace, and bliss flooded all over as knowledge of Siva himself. As he was progressing, Venkataraman's devotion and reverence for the devotees was increasing  he grieved at their travails and rejoiced in their triumphs. Venkataraman felt that Siva was glancing at him also just as he beheld the devotees. On completion of the book his emotional upsurge vanished, Venkataraman became his usual self. He seemed to have forgotten all those devotees and had given up all thought of following them. Venkataraman's life was flowing like a deep unruffled stream  of course, there were occasional whirlpools. He was very sensitive and could bear no rebuke. When he was young, Sundaram Iyer reprimanded him once at Tiruchuzhi. The boy was deeply hurt. He did not turn up at mealtime. A prolonged search ensued. He was found in the Sahayamba shrine -- possibly, he went there seeking the comfort of the Mother's lap. Such incidents did occur. Venkataraman was naturally of a helpful disposition. He assisted his mother and aunt in their household chores. Several mistook this characteristic and ridiculed him as an effeminate person. Some psychologists hold that only a person both with feminine and masculine qualities in equal measure can become a redeemer of humanity. Peace, grace, love and sympathy are feminine qualities whereas determination, courage and strength are masculine qualities. A complete or glorious life cannot be had without an adequate representation of both masculine and feminine characteristics. Can we think of anyone more graceful and at the same time more courageous than Sri Krishna? Is not Easwara an "ardha nareeswara?" A completely soft nature is like a creeper that cannot survive on its own. Similarly, an unyielding courage is like a wooden staff with no sap. Venkataraman's nature was a combination of both, which was why he became a redeemer of humanity. ONE year passed by, life went on as usual. 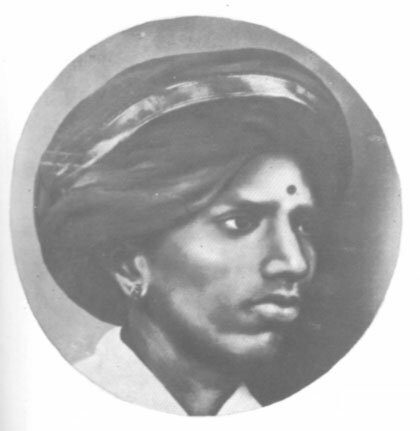 In 1895, Nelliappa Iyer left Tiruchuzhi for Manamadurai where he settled down as a secondry grade pleader. In the summer of 1896 both Venkataraman and his brother visited the place. In 1896, Nagaswami married Janaki Ammal. His in- laws also lived in Madurai. Venkataraman was in his seventeenth year and in his tenth standard, preparing for the public examination. Though not quite studious he had no fear of the examination. He enjoyed games which made him robust and healthy. It was mid-July. One afternoon, Venkataraman was lying in the first floor room when, for no apparent reason, he had a sudden fright that he would die; "I am dying," he thought. Years later, Bhagavan narrated the experience in the following manner ? "There was no reason for me to think like that. I did not even know what that state was nor why I was afraid. It did not occur to me that I should consult either a doctor or some elders. The only problem for me was what death meant and how it could be avoided. I resolved to solve it at once. Death meant that the limbs stiffened, lips tightened, eyes closed and breath stopped. By intense thinking, all this came to be experienced. But neither memory nor awareness disappeared. In other words, the sense organs ceased to operate externally and an inward look established itself. Even if the body died, the sense of `I' did not go. The consciousness of individuality was very much there. When the body was taken to the graveyard and reduced to ashes `I' did not perish because `I' was not the body. "The body was inanimate and without knowledge but I had knowledge. Therefore death was for the inanimate body whereas `I' was imperishable and was consciousness. "The knowledge one had when the body and senses ceased to function was not the product of the senses. The awareness of `I' was direct, self luminous and not a product of any thought. The entity which survived death was consciousness." Thus in a trice, Venkataraman had new knowledge. Though the experience was described step by step, it all happened in a flash. With neither the guidance of a guru nor any abhyasa, did any other yogi obtain that knowledge? That knowledge is unprecedented. Such a person is born with a purpose, he is an avatar and a teacher. (This Atman cannot be attained by study of the scriptures, nor by sharp intellect, nor by much hearing; by him is It attained whom It chooses  to him this Atman reveals Its Own true form). By his direct perception Venkataraman had a re-birth and by his knowledge he attained moksha [?]  simultaneously. He realized he was the imperishable "Aham." All fear of death left him. Much later Bhagavan was to say in Ulladu Narpadu (Reality in Forty Verses), "When those who are in dread of death seek refuge at the feet of the deathless, birthless Lord Supreme, their Ego and Attachments die and they, now deathless, think no more of death." HAVING tasted the bliss of the Self, Venkataraman ever abided in the Self and could bear nothing else, nor was anything else possible. Even if the body participated in some activity, thoughts were centred round the Self, he lost body-consciousness too. All this happened naturally and effortlessly. Abidance in the Self and devotion were the two strands which governed Venkataraman's life. For one who abided in the Self what was the need for devotion to God? This is what Bhagavan had to say on this subject much later, "I was not aware that experience of the Self was categorized and described variously. I was not familiar with philosophic terms like "Brahman" nor what an attributeless Truth meant. I was not aware that the individual Self and Easwara were one. I had an awareness of Easwara but not that it was the atma itself. One cannot say whether the thought process (mind) became extinct or was in abeyance. The Self was being experienced without any effort. In a sense it was abidance in the Self. It was the experience of the unbroken atma in the words of Sankara. In Jnana Vasishta it is described as "sattva pathi." "Did not Sankara and other self-realised persons worship God with attributes?" One moment it was submergence in the atma at the next it was in God. Sri Ramakrishna Paramahamsa also confirmed the last stages of saints and sages to be similar. "Other than Periapuranam I had not studied any other spiritual text by then. I had only heard of the Infinite Being with attributes as described therein. I had not heard of any attributeless Truth. Even while being conscious of the external world I was in the presence of Easwara  with no agony, or emotion," said the Swami. Yogic ways are of two types  the internal and the external. The jnana-marga (path of wisdom) transcends the five sheaths of the body. Raja Yoga is control of mind, whereas Hatha yoga is control of breath. Among the external yogas, the karma [?] and bhakti [?] margas are the most important. They are easily available even to worldly-minded, ordinary people. Among them, the Sankhyas discriminate against the body and attain the attributeless Parabrahman. Or some become devotees, fix their heart on Easwara with attributes, serve him and consider that other than Easwara there is nothing else. For those like Suka who choose the atma as the goal as well as for those devotees who choose Easwara as the goal  the result is the same -- it is the unification of the individual Self and Brahman. Venkataraman who would earlier visit the temple of Meenakshi only on holy days now became a frequent visitor. On seeing the sport of Sundarareswarar painted in the thousand pillared hall Venkataraman "recollected the emotional upsurge experienced about one year ago on hearing the name of Arunachala." He also was to further recall the life stories of the devotees which could not influence his life then. "I must also be full of bhakti [?] like the Nayanmars, I thought, Easwara, my father at Arunachala, would grant me refuge at his feet. I would frequently visit the temple and in the presence of the images of the Deities and Nayanmars would be beside myself with emotion and would be tear-filled. I did not know what that agony or emotion was due to. All that I would pray for was that the Lord should make me His devotee, or a member of his retinue or one with unswerving devotion. I knew not whether it was joy or sorrow. Either I was in meditation or in that state of agony. My whole body was flooded with this emotion and had a burning sensation. On beholding the images a storm would rise in the mind. Possibly, because the thoughts lost their anchor of the body some other foothold was needed. That was the reason for visiting the temple so frequently. Sometimes, I prayed for mercy, at some other times even that was absent. Tears would stream down, sometimes I would be stupefied". The only thing that showed itself outwardly in Venkataraman was the streaming of tears, he did not show any other visual characteristics of overwhelming bhakti [?] such as dancing in ecstasy or a choked voice or fainting. What was the cause for this turmoil? Was it due to some memory of an earlier janma? If so, what kind of experience did that earlier janma have? BY nature, Venkataraman kept very much to himself and spoke little. Some marked changes occurred in him but neither his family members nor friends could guess what was going on in his mind. He no longer participated in games, nor sought the company of his friends. His visits to the Meenakshi temple were more frequent and he spent most of his time sitting quietly, with his eyes closed in meditation. His former sensitivity and quick reactions got blunted. He, who was formerly intolerant of any offensive remark became indifferent to any jibe. One who protested about any injustice no longer cared about any injustice heaped on him. His former sensitivity gave place to resignation. He no longer had any preferences in the matter of food. He became humble. He continued to attend to household chores but as a matter of routine. He took up his books but his mind was elsewhere. His interest in studies, never great, further slackened. him and would say, "You sage, why do you have to bother about studies, you may as well go to the forests." Whatever be the goodwill and love of the relatives and however much they might wish for his worldly well-being, how could they approve of renunciation? Beyond the home, in the external world also, Venkataraman faced opposition. His friends avoided him and sometimes ridiculed him. Venkataraman never retaliated, never responded. Some friends, however, had great regard for him and some feared him. The teachers reprimanded him and punished him. To add to all these there was that burning sensation in different parts of his body. It left him restless and cooled down only when he sat in meditation. Facing hostility both at home and outside, Venkataraman developed aversion towards the world. His only love was for the Lord's feet. He thought that it would be nice if he were to die, but he had no such `luck.' "When will the Lord show His mercy towards me," he often lamented. It was Saturday, 29 August 1896 around eleven in the morning. As he did not study his grammar lesson, his teacher punished him asking him to copy a lesson from Bain's grammar text three times. Venkataraman sat in the room upstairs and began carrying out the imposition; with great effort he copied the lesson twice. "Am I a machine to carry out a task without any interest in it?," he asked himself. The very next moment the writing stopped. He put aside the grammar text, took up a meditative posture and began to meditate. Nagaswami, his brother, was closely observing all that. He could not tolerate it and without any premeditation he uttered these harsh, but true, words, "For one who behaves thus, what is the need for all this?" Such taunts from his brother were not new to Venkataraman but this time they pierced his heart like a speeding arrow. "Yes it is true. I have no interest in studies, my interest lies elsewhere. When I cannot carry out any household responsibilities, why do I need a home at all? What business have I staying here? ", thought Venkataraman and decided immediately to leave home for good. But, what next, where to go or what was the support? In a flash, "Arunachala" danced before his mental eye. About a year ago the Lord's Name throbbed in his heart but disappeared later. It appeared again that day. Once again the same thrill, the same devotion, the same emotional upsurge flooded him. He realized that the Father of the Universe would be his Father, his support and refuge. Was it another flash in the heart that made him hear these words? Or was his Father beckoning him to come? If the Father were to stretch his arms could the son fail to rush into them? Run he must, to Arunachaleswara's Presence. Much later Bhagavan himself said that he had left his home to seek refuge in Arunachaleswara and that some powerful, irresistible force brought him over. "I have discovered a new thing! This hill, the lodestone of lives, arrests the movements of anyone who so much as thinks of it, draws him face to face with it, and fixes him motionless like itself, to feed upon his soul thus ripened. What (a wonder) is this! Oh Souls! Be aware of it and live! Such a destroyer is this magnificent Arunachala, which shines within the Heart!" "THERE is no time to waste. I must reach the lap of Arunagireeswara. How to do so? Won't He show the way? ", thought Venkataraman and got up at once. His brother asked him where he was off to. "I have a special class on Electricity at twelve. I have to attend it," replied Venkataraman. The brother said, "Very well, there are five rupees in the box downstairs. Take the keys from aunt and pay my college fees. After all, the college is close to your school." The brother was not at all aware that he was facilitating the journey of Venkataraman who must have thought that his Father was coming to his help. It also confirmed his feeling that his departure was at the command of his Father. Venkataraman went down, hurriedly ate the meal served by his aunt and took the amount as directed by his brother. P.S. Your college fee has not been paid. Two rupees are enclosed." This letter, some say is evidence of the steadily increasing Self knowledge. But was it so? The `I' at the commencement is no indication of Venkataraman's identification with the body. To say so is to belittle his realization of the distinction between the body and Self, already acquired. His not signing the letter was not due to the absence of any individual doer. After all, he was in any case writing the letter. He was immersed in the formless entity. Therefore, it does not appear correct to assume that he had no consciousness of Venkataraman the individual. In the phrase "your .. fee" the distinction between `me' and `you' is obvious enough. The only things that are clear from the letter are Venkataraman's knowledge of the Self as distinct from the body, actions taking place without any particular intention, and his anxiety to see that his relations were not inconvenienced on his account, a noble trait in itself! Had the train arrived at the scheduled time of 12 noon at the station that day, Venkataraman would have missed it. It came one hour late, which was why, though he took time in walking the distance from home he did not miss the train. Venkataraman thought that it was further proof of God himself attracting him like a magnet and resolving all inconvenient situations on the way. He bought a ticket to Tindivanam paying a little less than three rupees.1 Had he seen the fare table a little below he would have noticed the Villupuram-Katpadi line and Tiruvannamalai station thereon. His mind was centred entirely on Arunachala and so he could not notice anything other than his goal. He did not want to ask anyone else as that could be a give-away. He was in a state of excitement and had no interest in any contact with others. He got into the train on its arrival and sat quietly, not speaking to anyone. The train sped on  he did not turn to look back at the beautiful city of Madurai nor at all those dear places where he had played since childhood. Venkataraman sat, eyes closed, oblivious of his physical body or was it that his body was flying in the "inward sky?" Along the banks of the South flowing Vaigai were green fields, coconut and mango groves all presenting a picture of Nature's bounty. Wasn't this beautiful earth a manifestation of Easwara? A little later came the Dindigul fort where Venkataraman played about in his younger days  there was only one game left for Venkataraman thereafter. This was to dwell in the ocean of blissful nectar! Such was Venkataraman's state; how could he look at Nature's beauty or his favourite haunts of bygone days? 1India did not have decimal coinage during those days. The amount paid by Venkataraman was Rs. 2-13-0 or about Rs. 2.80. He had about 20 paise left. THE sun was setting. A maulvi seated in the same compartment was narrating the stories of different sages to his fellow passengers, who were absorbed in his narration. But this young man was indifferent, did not even open his eyes. Curious, the maulvi approached him and asked, "Swami, where are you going?" Maulvi: I am also going there. Venkataraman : Is it so? Maulvi : Not exactly, but to Tirukkoilur the station adjacent to it. Venkataraman : (Surprised) Is there a train to Tiruvannamalai? Maulvi : Of course. To which station did you buy your ticket then? Maulvi : Oh my! Why to Tindivanam? You have to get off at Villupuram and take another train that goes to Tirukkoilur and Tiruvannamalai. The Father was lending a hand to lead His son! If not, why did the maulvi get into that very compartment? Why did he accost him and give him so many details? Maybe, the one with matted hair, Siva, guided him. Gladdened, Venkataraman resumed his meditation. By the time he reopened his eyes, darkness had enveloped all round, the train reached Tiruchchirapalli station. Quite strangely, the maulvi who said he was going to Tirukkoilur was not to be seen; equally strangely, until then Venkataraman was not hungry at all. It was dinner time and then he felt hungry  as if he was duty-bound to feel so. He bought two country apples and began to eat. He just had two bites by which time he felt satiated. This again, was quite strange. Normally he had a substantial meal but on that occasion a meagre meal sufficed. He fell into meditation again. At the early hours of the next day the train reached Villupuram. Venkataraman got down and began looking for the way to Tiruvannamalai. He was hesitant to ask anybody. Yet his Father carried on his duty! As Venkataraman walked along he saw several guide posts one of which pointed towards "Mambalapattu". But he did not know that Mambalapattu was on the way to Tiruvannamalai. He roamed about hungry and tired and reached a hotel where he was told that meals would be ready only by noon. He decided to wait and sat there and fell into meditation. The owner of the hotel was observing the lad who was bright, very fair with thick dark hair, earrings, without any luggage and lost to the world! Who could he be? By noon the food was ready; the hotel owner woke up Venkataraman and served him. Venkataraman offered to pay for it but the hotel owner declined to take it on learning that Venkataraman had very little money. Maybe, that was the Lord's way of showing His grace! With that meagre amount Venkataraman could buy a ticket to Mambalapattu. He travelled by train upto that point and then began walking. He walked on till it was quite dark. He reached Arayaninallur. Arayaninallur, also known as Sivalankapuri, is a great pilgrim centre. On a small hillock near the village is situated the Atulyanatheswara Temple. The great poet-saint Jnana Sambandar sang in praise of Atulyanatheswar. He also consecrated an image of Arunachaleswara there. When Sambandar sat in meditation, Arunachaleswara appeared first as a column of light and later as an old Brahmin but Sambandar could not recognise him and made enquiries. The visitor replied that he belonged to Arunagiri and that he visited Arayaninallur every day to collect flowers for Arunachaleswara. Sambandar asked the Brahmin to take him also to Arunagiri to which he agreed. On the way, the Brahmin disappeared. A band of robbers surrounded Sambandar and his retinue and robbed them of their belongings. Sambandar was taken aback and prayed to the Lord, who revealed himself and told Sambandar that the robbers were part of His retinue (ganas). He promised to take him across if Sambandar stayed back as his guest for dinner and also offered to return all the articles stolen. Normally, Sambandar never ate without serving some guests but on that occasion, himself became a guest of Easwara. How Sambandar reached Arunachala and sang in praise of Arunachaleswara is a different story. Tired and exhausted, Venkataraman reached the temple only to find the doors closed, as the priest had not arrived. He waited till the priest came. The priest went in and got involved in the pooja. Venkataraman walked in and settled down in a corridor, shut his eyes, opened his heart and began his mental pooja of Easwara. It was at that very spot that Jnana Sambandar saw the column. Sambandar was also barely sixteen when he had the experience. All of a sudden, a bright light, from a source unknown to Venkataraman, enveloped him. He opened his eyes and saw nothing but bright light all around. He thought it could be the light of the Deity and walked towards the sanctum sanctorum. But by the time he reached it, the light vanished. The sanctum was dark, the light could not be from there. Venkataraman returned from the dark sanctum to his former place in the corridor and resumed his meditation. The temple priest completed his pooja and called out, "Who is there ? it is time to close the doors of the temple. Get up and go." Venkataraman came out of his meditation and pleaded for a little prasad. The priest said brusquely, "There is no food ready for you here." "Alright, at least let me rest here this night," asked Venkataraman. The staff of the temple intervened and said, "Kilur is about a mile from here. You have a Virateswarar temple there. Maybe you can get some prasad there. Come along." Venkataraman accompanied them. At the temple, he fell into meditation as long as the pooja was going on. After the pooja the priest who was distributing prasad flatly refused to offer him any. One of the temple musicians took pity on the boy who was tired and suggested to the priest that his share of prasad might be given to the lad. Someone took Venkataraman to a nearby house for water. By the time Venkataraman reached that house he fainted  nobody knew whether it was due to weakness or sleep or meditation. He revived a little later and noticed that he was at a different spot. All the food was scattered on the ground, and a crowd gathered round him, watching him. Venkataraman picked up the food, drank some water and slept on that street. The following day was Gokula-Ashtami August 31st 1896. He was hungry and still had to go twenty miles. As Venkataraman was walking down the street he saw the door of one house ajar but nobody was to be seen inside. He went in and asked the owner, Muthukrishna Bhagavatar who was taking his bath, in the back yard for food. The Bhagavatar had a widowed sister who looked after the house, but at that moment she had gone to the nearby river to fetch water. There were no other female members in the house. The Bhagavatar asked him to wait till she returned. In due course, she came and seeing the boy asking for food looked upon him as Krishna himself come in the form of a Brahmin youth seeking food! She saw the hungry look on his face and though she commenced cooking she felt the lad would not be able to withstand the delay. She said to him, "Come along, I shall serve you some left overs for the present." Venkataraman had barely two morsels when his hunger vanished. But the lady would not leave him till he ate all that was served. Venkataraman had no energy left to walk any further. Nor did he have any money to purchase a train ticket. What if he sold the ruby earrings? But he had no experience in such deals. Finally he thought it best to raise a loan and approached the Bhagavatar. He answered all the Bhagavatar's questions and added for good measure, that he had lost his luggage in the train. He gave his real address also  in the confidence that at that distant place there was no chance of the news reaching any of his relatives. The Bhagavatar examined the earrings and was satisfied with their quality. He estimated that the earrings would cost twenty rupees at least whereas the lad was asking for only four rupees. He saw no reason to suspect anything wrong and gave Venkataraman the money he wanted. By then, the food was ready. The lady of the house invited both of them and served them a sumptuous meal  it being a festival day her joy knew no bounds as she thought that her guest was none other than Krishna himself. She also prepared several sweets to offer to Krishna that evening. She gave a packet of them to her guest even before offering the sweets to Krishna. How blessed she was! Venkataraman promised the Bhagavatar to take back his earrings as soon as possible. He collected the packet of sweets and set out for the station. At a little distance away from the house he tore to pieces the slip of paper containing the Bhagavatar's address  was he to get involved in worldly affairs any more? He reached the station and slept there that night. The train was to arrive early in the morning. Venkataraman purchased a ticket for Tiruvannamalai. We have spoken several times about Venkataraman's hunger. It is true, he experienced hunger, his body felt weak and on several occasions would faint. But when he attempted to eat, even a little food would suffice. No reason could be given for this. "Helpless have I wandered day by day. I now seek refuge in you, come to my rescue"
THEY were the early hours of the day, darkness was slowly fading away, right from the moment he boarded the train. Venkataraman was eager to see Arunachala. As his cherished goal was nearing, his excitement mounted. At first hazily, a little later more clearly and finally explosively the peak of Arunagiri, its middle, its foothills and its base, with the temple towers touching the stars all these came into view. Venkataraman's heart was immersed in an ocean of joy, his body quivered, his eyes brimmed with tears which came in the way of his beholding his beloved Arunachala to his heart's content. Soon after the train reached the station, Venkataraman walked swiftly to the temple, almost running. In those early hours except the wind god, nobody was paying obeisance to the Lord. Even the rustle of that wind faded away from Venkataraman's earshot. It was the hour when the temple remained closed. Till eight nobody would come to the temple nor open the doors. But unusually, that day all the doors were wide open. Was it a moment when the Father gave a secret upadesa to his son? Or did He feel that the inspired son deserved nothing less than a private audience? Or did He instruct the son: "You search for me in the depths of your heart, you shall find!" Venkataraman walked straight into the sanctum sanctorum. Having done so, he reported to the Lord, "Father, I have come according to your bidding, I offer myself to you." The emotional upsurge which flooded his heart vanished. The conflict of emotions abated. Peace reigned. That experience transcended both joy and sorrow  it would be appropriate to describe it as pleasurable. Tears flowed down his cheeks. The burning sensation had gone. There was no agony of any kind. An overwhelming happiness drowned him. The son who till then was playing different parts in this world was no longer going to leave the Father's presence. All connection between him and the world snapped. Let the Lord give his benediction to the world. For Venkataraman, Arunachaleswara was the sole refuge. Never would he leave His lap. "He obtained That, having obtained which, there was nothing else to desire." Farewell to the turmoil of this world, welcome to absolute peace. Henceforth whatever he did (physically, mentally or by any other means) was to be offered to the Father. To whom did he offer himself? To his Father, Easwara. Who was Easwara? Was it the stone linga in front of him? Or Arunachala, the hill beyond? Neither. He was different from the body. He was the spirit. The body was its sheath. The hill and the linga were the sheaths enveloping his Father. Else, how could the Immeasurable and Omnipresent One be limited to these tiny things? They were mere symbols of the limitless Substratum of this Universe, the source of all the power and acts in the Universe, the all pervasive Truth. Venkataraman was established in It. What was the nature of his Father? What was the relation between his own ego and this universal, all-supporting, all-destroying, authoritative secret nature? How was he to ascertain this? Everyone should find out the Truth for himself. This is what Varuna enjoined on Bhrigu too. He said "Learn by tapas [?]." DID a jnani [?] need tapas [?]? Venkataraman had already realized the supreme Self. There was no need for any further effort. But for convenience we shall use the expressions "tapas [?]" and "initiation." Readers must not get misled. On the very day Venkataraman left his family and offered himself to Arunachaleswara all connection with his earlier life was torn asunder. Yet a few symbols remained. Why retain even them? He had only to be in the bliss of Self knowledge as nothing else was needed. He would tolerate nothing that came in its way. This was the only tapas [?] the only initation (diksha). His earlier life ended. Only abidance in the Self remained. The sastras say that for initiation a guru is necessary. For Venkataraman the guru was Arunachaleswara Himself. Ordinarily the guru initiates by touching various parts of the disciple's body and teaches him a mantra. His Father initiated him by just a look and like Dakshinamurti gave him a message through silence. Venkataraman began discarding the symbols of his earlier life. Some he rid himself of by his own will, others left him on their own. With that, his outward life and inner life became synchronized. Venkataraman tore and threw away the piece of paper on which Muthukrishna Bhagavatar gave his address at Kilur itself but the packet of sweets and a little money were still with him. On the very day Venkataraman left his family and offered himself to Arunachaleswara all connection with his earlier life was torn asunder. After offering himself at his Father's feet in the Arunachaleswara temple, Venkataraman came out into the vast temple of the world. He walked about aimlessly and reached the Ayyankulam Tank to the east of Arunachala. He noted that he still had the packet of sweets, "Does this need the sweets too?" he thought and flung it into the tank. Right from his younger days, Venkataraman had thick black hair. It was a natural embellishment. Did the body need any decoration at all? And why take the trouble of taking care of it? As he was returning from the tank, somebody asked him whether he would be interested in having his head shaved. Venkataraman assented and that stranger took him to the house of barber who usually worked at the temple. The stranger disappeared. Why did he ask Venkataraman whether he wanted his hair removed? The barber told Venkataraman that normally he would charge a higher amount for those wanting a tonsure at the temple but that he would give a concession to Venkataraman. He completed the tonsure in no time. Venkataraman walked around and reached a garden to the east of the tank. There he tore away his clothes except for a codpiece and threw the rest into the tank. Wearing a codpiece is symbolic of chastity in word, thought and deed. The Father had vanquished Desire (kama [?]). Could the son be any different? Venkataraman threw away the little money still left with him. The yagnopaveetam (sacred thread) is indicative of a Brahmin birth and culture  this indicated that Venkataraman was a Brahmin, son of Sundaram Iyer. Henceforth he was the son of the Universal Father, Arunachaleswara. He was beyond all caste distinctions. The sacred thread could also cause a sense of superiority. Hence, he got rid of it. After his tonsure he did not want the luxury of a bath, but would the guru Arunachaleswara allow any violation of convention? Venkataraman took to sannyasa [?] in the midst of water. As he was returning to the temple, there was a heavy downpour drenching him. The heavens themselves provided the bath. Venkataraman did not visit the temple sanctum during the next three years. There was no need for it. After all, the Father was present in the cave of his heart. Venkataraman avoided speaking to anyone as he did not wish to have anything to do with people. Speaking itself became impossible. When he was always immersed in the Self and never even looked at the outside world how could he speak? This silence went beyond mere voice and touched the Self. Two years later, even when the Swami wanted to speak he could not as the words did not emerge clearly. It was only much later that normalcy was restored. Quite unintentionally silence itself became his characteristic. The Swami once said that silence should be the sadhaka's aim and that it would become the siddha's characteristic. But in his case, silence became his characteristic even without his passing through the sadhaka's phase. This is how he had initiation. What about life in the world? As long as the body was there it needed nourishment. After all, the body is the instrument of all sadhana [?]. But Venkataraman paid no heed to that thought  for him whatever happened to the body was the responsibility of the Father. The one who provided sustenance to the birds, fish and the other animals would surely not neglect him! The Swami chose the temple for his dwelling. 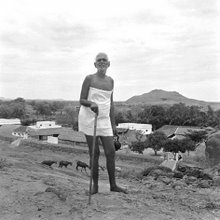 For a sannyasi, the caves of a hill, the banks of a tank, a temple, the trees of a forest  are all suitable say the sastras. Brahmins used to take to sannyasa [?] and go about Arunachala in hundreds whereas such wandering Brahmin sannyasins were few. They came to be known as Brahmana Paradesis. The new Paradesi took his place at a platform in the thousand pillared hall for his meditation. Winter was just approaching, the monsoon had not abated. He had no clothes either to spread on the floor or to cover himself with. He never sought people's company and even if any such company came his way he moved away. He sat silently, with his eyes shut. Even while walking about he never spoke to anyone. He never sought food from anyone and if anyone offered him food while he was wide awake, he would accept it. He abided in the Self, he held his senses captive and controlled his mind. He was enjoying the Kingdom of Yoga. This lad never sought anything. However, even if he left others alone, they would not leave him alone. For them he was an object of curiosity, or ridicule or blame but for a few, he was an object of respect. He was at a new place, helpless, unprotected ? but was he unprotected really? His only refuge were the feet of Siva but that Siva never appeared before him! This lad became the target of the local urchins who looked upon him as a madcap. Did not `Mad Seshadri' arrive at that town four years earlier? Just as they showered pebbles, or pieces of pots on Seshadri they did the same to this lad also. But they threw their missiles from a distance lest the `mad-man' retaliate. As a result, the missiles missed their target. But they disturbed his meditation. To avoid all this he moved to the Pathala lingam [?]  the cellar. The urchins were afraid of entering that place. The insects and other fauna who had the place all for themselves had now a competitor in their midst. While the lad sat in padmasana and was enjoying the bliss of atma, the vermin enjoyed his flesh and blood. In his meditative mood the Swami was not at all conscious of what was happening. Among those who visited the place during the deepam festival some admired the boy's severe austerities. One among them was Ratnammal, wife of Velayudha Chetty. She fetched him food occasionally and, moved by his condition, begged him to stay at her house. But the Swami's attention was elsewhere. He scarcely heard what she said. Where was the question of his acceptance? She was disappointed. Yet she left a piece of cloth for his use -- either to cover himself or to use on the floor. The Swami in meditation remained that way, so also the cloth stayed where it was kept. How did Ramana, in his deep tapas [? ], get his food? pillared hall Maunaswami of the Gopura Subrahmanya shrine, a Malayalee, visited the hall and observing the boy utterly exhausted, asked one of his followers to fetch him some food. Some food  that too obtained as alms -- was brought. It consisted of coarse rice, a little salt, and pickle. It was served to the lad. Thereafter his requirements of food were taken care of by Maunaswami. The nuisance of the urchins did not stop  they continued throwing all sorts of things into the cellar. The Paradesi had no fear of being hurt  he was beyond these. Once some Muslim boys also joined the urchins and tried to enter the cellar but fear held them back. So all that they could do was to throw things. At that very moment one Venkatachala Mudaliar passed that way. He knew that the Swami was in the Pathala linga. He immediately got hold of a tree branch and rushed towards the urchins. Seeing him thus armed they took to their heels. 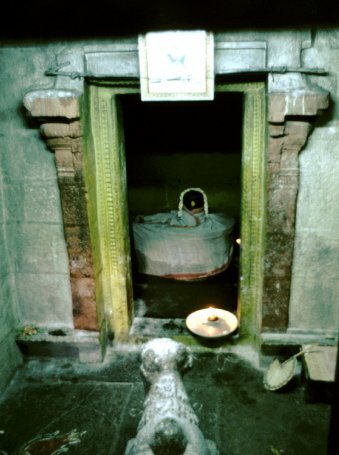 Out of the Pathala linga emerged a dust-laden Seshadri Swami. An anxious Mudaliar asked Seshadri Swami if he was hurt. Seshadri Swami said that Chinna Swami who needed attention was inside the cellar and went his way. Mudaliar went down and in the darkness could see nothing at first but later the outlines of the Swami  covered with dust and seated in the padmasana became visible faintly at first and a little better later. Mudaliar at once went to the Vazhaithotam where Palaniswami was staying with his disciples. He took four or five of them for help and went back to the cellar. They lifted the Swami and brought him out and seated him. It was only then that the Swami regained his senses. "It is blasphemous to disturb the tapas [?] of such a one," they thought and left the place. Thereafter the Paradesi became Brahmana Swami. As long as Brahmana Swami stayed at the Gopura Subrahmanya shrine, Maunaswami who lived there looked after him. Right from day one he took care to ensure that the "silent Brahmin young boy" had food. He shared his food with him especially fruits and milk collected after abhishekam to Uma Devi. The milk was mixed up with water, turmeric, sugar, pieces of fruit and camphor. Brahmana Swami had no preferences and gulped down whatever was offered. One of the senior priests noticed this and was sorry that this concoction was being offered to him and henceforth arranged that milk alone was given to the Swami after the abhishekam without other items being added. If on any day there was delay someone would run to the Brahmana street and arrange for food being offered to the Swami  this was known as bhiksha. Thus two months passed by. Vazhai garden was to the west of the thousand pillared hall. As noted earlier it was a flower garden but not a plantain garden as suggested by the name. There were well-grown creepers of pink flowers known as Kasturi patte . Brahmana Swami moved over there from the shrine. He commenced his meditation under one bower and by the time he completed it he found himself under another. With the passage of time his codpiece tore and towards the end of 1896 he was unclothed for some time to which the temple authorities took exception. This was the next place chosen by the Swami for his tapas [?]. Here also during meditation the Swami's body would move and find a place in between the wheels of two chariots. He would spend most of the time near the wall in semi-darkness. Later he spent some time near the Sivaganga tank, first under the bilva tree and later under the ippa tree. Winter had set in by then. It was 1897, January-February. He had nothing to cover himself with. It was quite chill. The only place where he could stay was the base of a tree with the sky above and the dusty ground below, wet with dew. It is said that rishis of yore did their tapas [?] in the middle of water ? this tapas [?] of the Swami was no less severe! At a village called Tirumani near Vandavasi lived a Saivite renunciate named Uddandi Nayanar. Being averse to living with his family he lived apart in a math [?]. Later he studied numerous Tamil philosophic texts but could experience neither peace nor the Self. He visited Arunachala in December 1896 and during his circumambulation noticed the young tapasvi in deep tapas [? ], lost to the world. Nayanar was deeply impressed and thought: "This is tapas [?]. This is abidance. If such a one does not experience the Self who else will? By serving him I may also experience the Self." He firmly believed in this. Nayanar also decided to stay under another nearby tree in that chill weather and devote himself to the service of the young tapasvi: Much later the Swami himself described Nayanar as a person of detachment. Except when Nayanar had to go out to cook his food, at all other times he stood guard over the Swami and prevented curious crowds from collecting there. It was no easy task  the urchins harassed the Swami whenever Nayanar went out for food. Once, when no one was around and the Swami was unaware of his body, a particularly vicious urchin passed urine on the back of the Swami and ran away complimenting himself on his `cleverness'. After regaining consciousness the Swami understood what had happened. What could Nayanar do in such circumstances? The Swami was a personification of tolerance but Nayanar could not bear it and felt deeply hurt. Nayanar had another grievance. He did not wish to speak to the Swami unless the latter spoke to him first. On the other hand, the Swami never even opened his eyes. Nayanar used to sit at a distance studying such philosophic texts as Jnana Vasishtam, Kaivalya Navaneetam and looked forward to his Swami's grace. Nayanar was the first attendant of the Swami.